Our backyard is definitely a work in progress. After raising 5 kids, numerous cats and several dogs it had seen better days. Early years of lush green had yielded to sand boxes, yard games, the sound of happy laughter and busy feet. Spending time with family in the backyard was a messy, cherished tradition. There’s a reason I’ve never shared this outdoor space on the blog! It just seemed like we were never finished with it. Or maybe I just hadn’t made it a priority or taken the time to slow down and enjoy its beauty. Your home doesn’t have to be perfect to be loved. I take absolutely no credit for any outdoor beauty at our house. My husband and I have always had the rule guideline that he takes care of the outside and I take care of the inside! Honestly, though, I’ve always had allergies and he enjoys puttering around outside so I’m perfectly content to let him “decorate” as he pleases. So sit back and let me show you around! After an amazing deck restoration project it’s been even more enjoyable to spend time outside on our back deck. Throughout our busy parenting years we’ve hosted birthday parties, cookouts, a surprise graduation party, a sweet sixteen party (details coming soon!) and many holidays here with our extended family. My husband works hard and rests hard and on most cool Saturdays I can find him mid-afternoon sitting by the fire pit, half dozing but mostly relaxing! 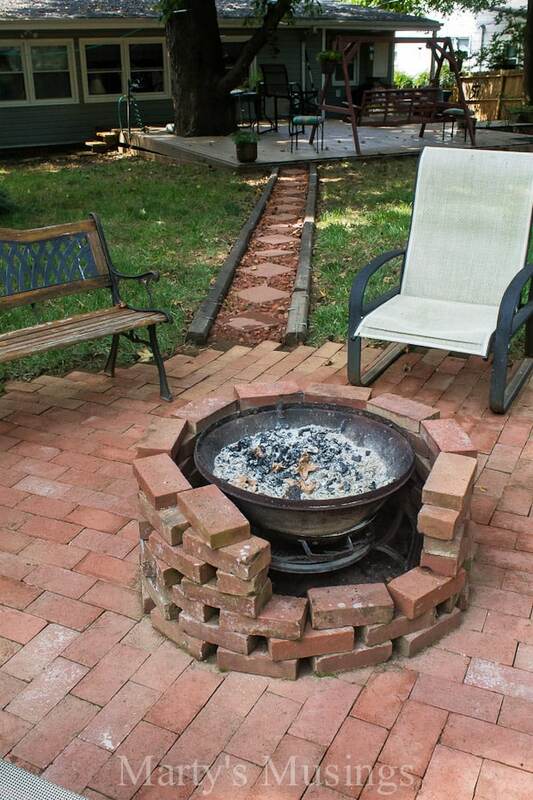 I have to share his ingenious (and budget conscious) patio ideas and fire pit. This little path leading up to the fire pit was created in the place our above ground pool was for many years. 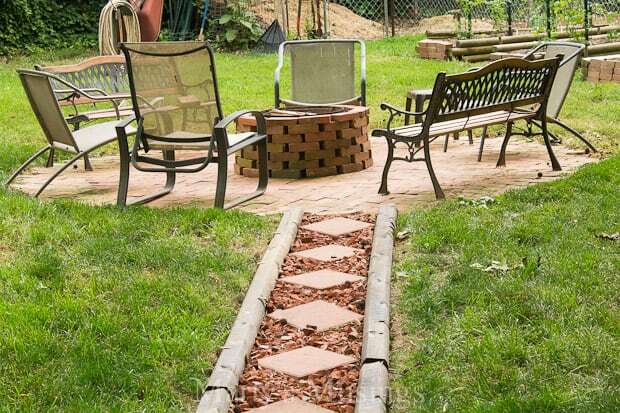 Tim used landscaping timbers, pavers and crushed bricks to create a fun little walkway in the backyard. 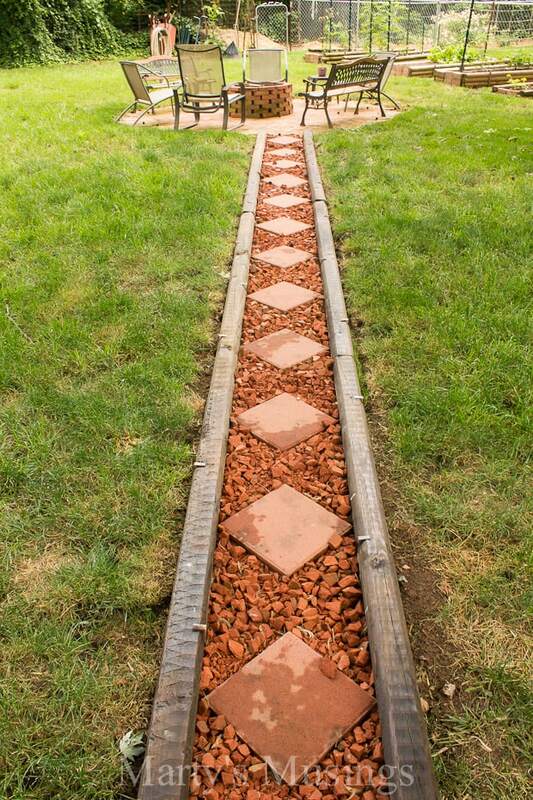 Come on down the brick path to our repurposed patio and fire pit. There are plenty of chairs for sitting around the fire and chatting. My clever hubby asked permission from our church to retrieve the brick patio from a home they tore down. 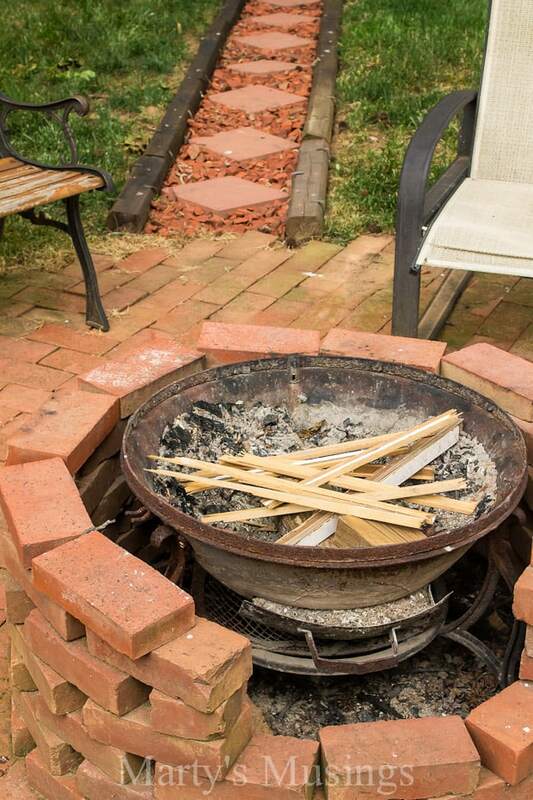 In addition to those pavers and bricks he took the remnants of our old chiminea and built a fire pit around it. Talk about inexpensive! Inexpensive if you don’t count the cost of the old van with the broken axle that died a slow death in the driveway. If you were sitting by the fire pit gazing back at the house this is what you’d see. You might just want to take a chance on that hanging chair. Sure looks comfortable! Tim is slowly nursing our grass back to a healthy green and eventually we will do more landscaping. But for now, my blog header says it all. Our backyard is a reflection of the years spent with family, laughing and fighting and playing together. If you come visit this summer I hope this will be what you see. It’s the way summer was intended. If you join us in the evening we might even wrangle up some Snicker’s Smores for you! Our big project outside this year has been the addition of a front deck on the house. I haven’t done a reveal yet but if you follow me on Instagram you can see the progress or you can read all about our plans for our dream deck. Your back yard is fabulous…and I love that your deck doesn’t have a railing. It just opens everything up. Thanks for asking me to be a part of this tour! it is perfect finished or not, decorated or not, grass or not…. especially if it is a place of peace for you or gathering for your family. My family loves our family pit just as much as you guys do. Happy summer! Summer just isn’t complete without sitting around the fire pit but we use it a lot in the fall and I enjoy the cooler weather. I’m bad about just hanging out inside the house so this is good to get me out in the fresh air! I can’t think of a more wonderful backyard to spend family time in. You’re fortunate to have such a huge deck! I love hearing how all of you spend time bonding in such a wonderful space. Suzy, you will have to come over when your life calms down or I’ll have you and Amy over when it’s cooler and we enjoy both the front AND back deck! 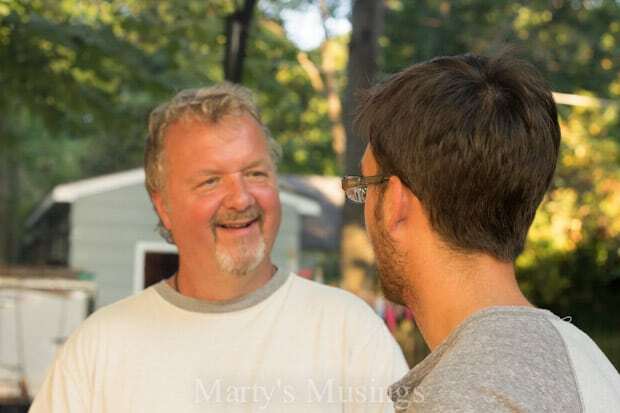 Marty – what a wonderful space to enjoy family time! 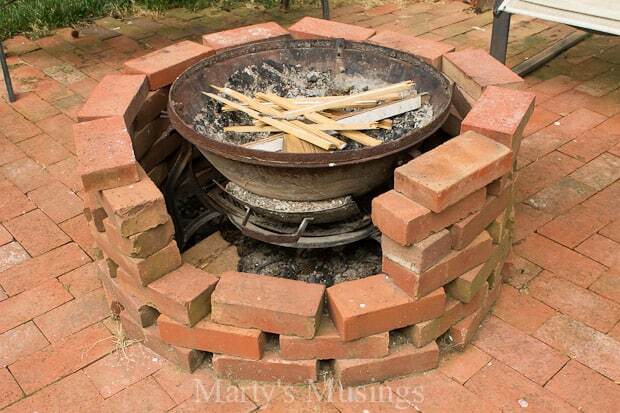 Loving that ingenious fire pit your husband created! Thanks, Linda! He is one creative guy! Puts me to shame! Your backyard looks like the perfect place to relax with family and friends. Love your firepit and can’t wait to see your new deck. Hey, Paula. We sat out on our new deck for the first time tonight! I’m excited about having another area to create memories! Love your entire back yard. Looks like a great place to sit back and relax. I want a fire pit! Sorry I missed the question marks, lol. Kathy, I’m glad you missed my half finished sentence! It was so funny because I literally leapt into the air when I remembered I hadn’t finished that part! 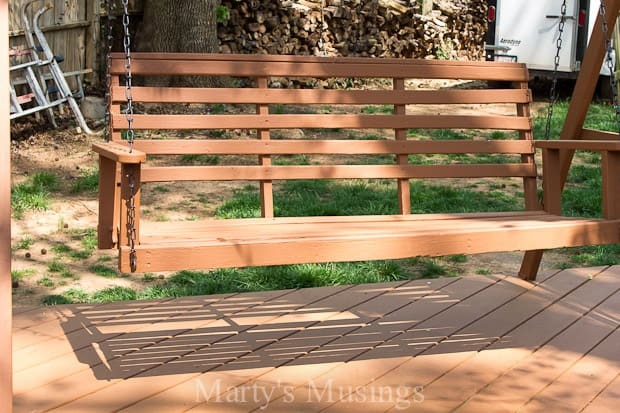 Marty, You husband did a wonderful job creating an area that your family and friends can gather! I would love to try the swinging chair! I’m all about relaxing in a swing!!! 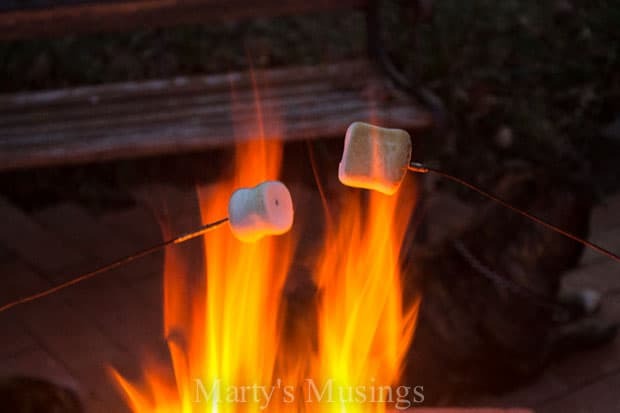 Snickers S’mores sound FABULOUS! Yvonne, you just come on over when you’re in the neighborhood. I understand my friend Amy is coming to see you. What a treat to see your wonderful and visit with you. I’m jealous but you will have such fun! Marty, I love the way you share your home as it was before, as it is now, and as it is becoming! You and Tim are making such great progress into putting your “stamp” on every inch of this property, and it looks as if you’re enjoying yourselves in the process! Thank you for being so inspiring and for sharing your wonderful spaces with us. 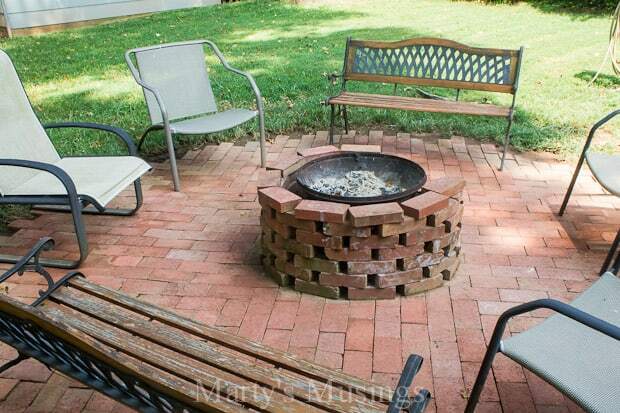 Love that outdoor firepit–that’s genius! Hi, Richella. This space has definitely gone through a progression. Having older kids, I know you understand that! It was very kid friendly and photograph unfriendly for a long time, but it has served us well over the years. Now one day we’ll have grandkids to buy ride on toys for! Your backyard looks like the perfect place to sit, relax and visit. I love that fire pit, that is fabulous. Thanks, Marty! We do love sitting around staring into the fire! It’s mesmerizing. The fire pit is awesome! We’ve been wanting one for a looong time but for some reason it always seemed like it needed to be hard… but your version looks so simple and beautiful! Maybe we’ll get one this summer! Hey, Kelly! I don’t know what it is about a fire pit that says relaxing, but it does! My husband is so creative but he’s also a hard worker, and I benefit from it! You guys should get one for sure! Thank you, Kim! The backyard has definitely evolved over the years. It was very kid friendly for a LONG time! 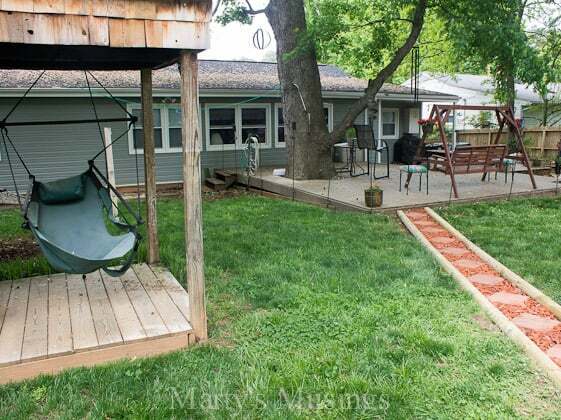 Marty, how lucky you are to have such a spacious back deck and I love the way it was built around that tree! I am dying to have a fire pit so I must show your photo to Leo. I would love nothing more that to sit around it and stare into the flames and make some of your s’mores! Thanks, Jane! The back deck is so fun with the tree, but I just don’t even hardly notice it anymore. It’s just so much a part of the backyard! Such a great deck and fire pit area! I’ve got to get my hubby busy on one of those! Hi, Shanna. The fire pit has been fun and it was a no budget project! 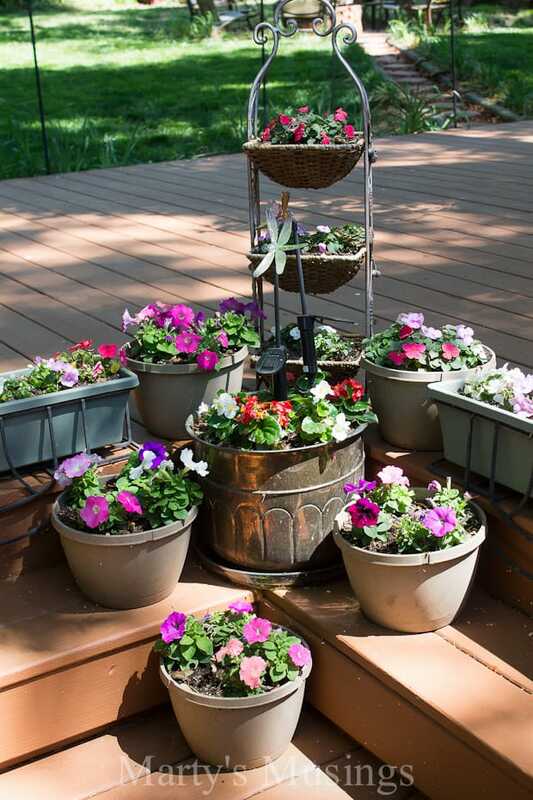 Your deck is so pretty – love all the blooms and your fire pit! A great place to relax! Thanks, Courtney! You have such a way with photography and staging and I could learn so much more from you! I’m still in the learning process! Hi, Jennifer. Our front deck has no shade (new DIY project this year) but the shade in the backyard is totally welcome! It’s already hot here in NC. Thanks for visiting! Your backyard looks like such a relaxing place to spend time with family and friends! Thanks for sharing it with us! Hi, Allison! Thanks for commenting and joining us for the tour. I’m working my way around to all the posts! Hi, Mary Beth. We love our backyard even if it’s not magazine worthy! Thanks for joining us on the tour! Hi I would like to make this firepit aprox how many brinks did you use? Cathy, I’m going to send this question to my husband and I’ll email you what he says. Thanks! 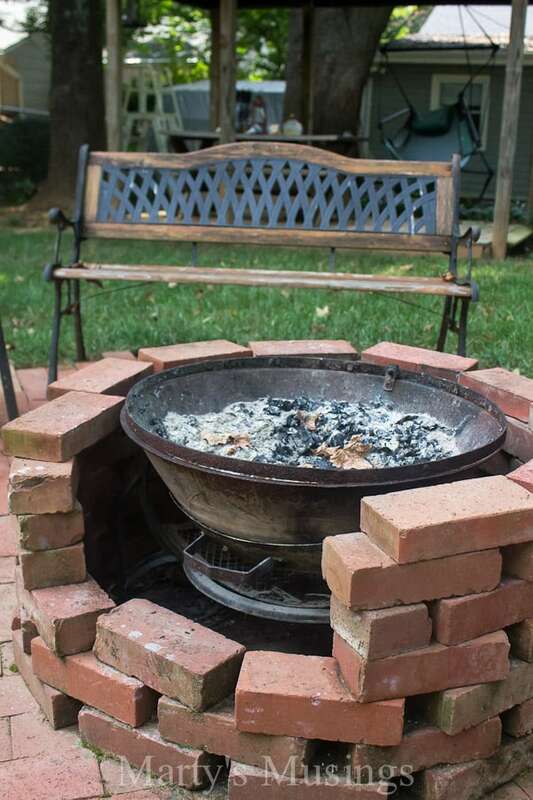 Here’s the info on the fire pit from my husband: Our pit is approximately 12′ in diameter and a rough estimate is around 350 brick pavers (slightly smaller in height than a full brick). I think if I had it to do again I would go another foot or so out. A big fire can get pretty hot and I have had some spark damage to the furniture. Oops! absolutely wonderful! i looove the tree in the deck, and the view looking back towards the house from the firepit area. enjoy! Thanks so much! 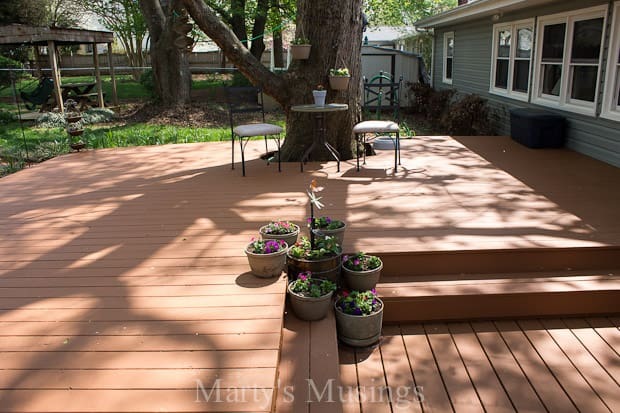 That tree in the deck was source of much pondering before the deck was built, but we are so glad we went around it! 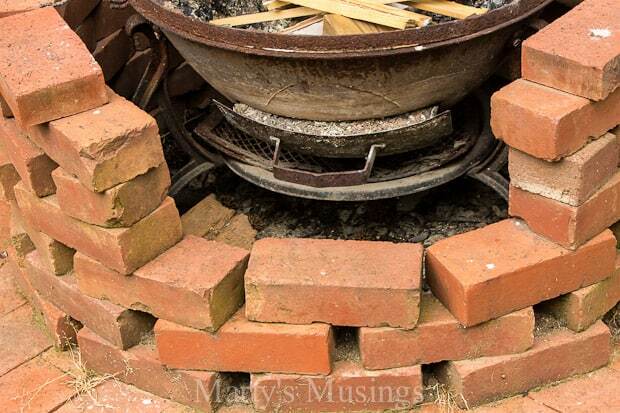 i am curious how the bricks stay in place in the circle fire pit. if they are just sitting on top of one another wouldn’t they fall down or lose their shape? thanks for any advice/feedback. 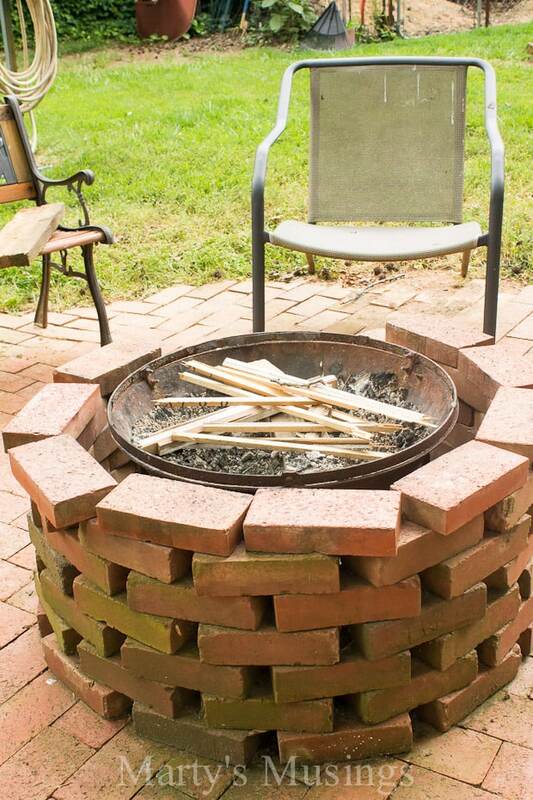 i’m researching building the same exact fire pit. Hi, Zach. So sorry it’s taken me so long to respond. Going through a family crisis. 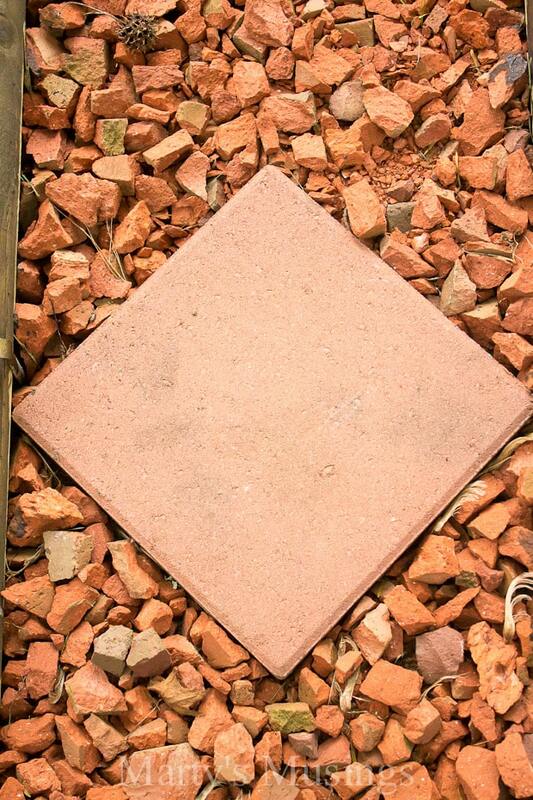 Here’s what my husband had to say: Good question but I have not had any problem with the bricks moving or falling. Of course, that may depend on the amount of traffic you have right around the circle or if you have small children or dogs that might bump the structure. I wanted this to be easily disassembled so I could clean inside and re-sand the surface underneath (brushing play sand into all the cracks between the bricks keeps them from moving and prevents weed growth). If you wanted to make your structure more permanent, you could put morter on just the ends of the bricks where they stack on each other. When dry, this will be just like a wall. One quick piece of advice; take the time to make sure your sub-surface is as level as possible and use that sand to totally level it out before you start laying the brick down. You won’t be able to correct this later. Tim. I love the beautiful space created for you and your family. 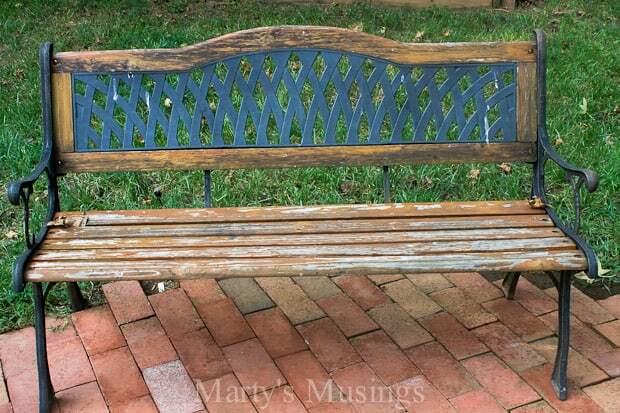 I’m a new DIY, but enjoy getting great ideas from people just like you. Hi, Deborah. Thanks so much for the compliment! I really haven’t been doing this for very many years but I’ve taught myself as we went along! I appreciate you reading and I hope you’ll join my email list so you don’t miss any posts or the information I only send out to my subscribers. Have a great day!